After almost five years of work the Tamesna Center had its grand opening. We wanted to celebrate and to announce our presence officially so that the government will participate in or take over some of the programs. Our goal is for the center to be managed locally. It will be a gradual change over, with our overseeing to make sure things keep running. Sidi is a master of organizing festivals so we had lots of camels, women tinde singers Wodaabe dancers and official and unofficial guests, all televised on Niger national television. Our group of volunteers and film crew enjoying the festival. 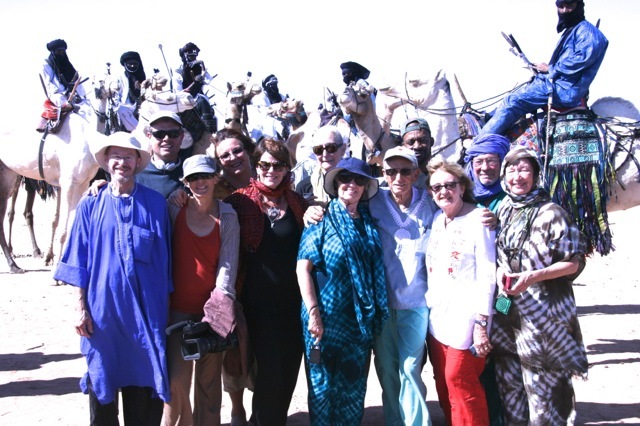 (from left) Larry Beckett, Ned Clark, Benedicte Schoyen, Linda Lamb, Leslie Clark, Rene Briggs, Louine Skankey, Bob Skankey, Cooper Bates, Linda Taylor, Bob Davis, Dana Huffman. 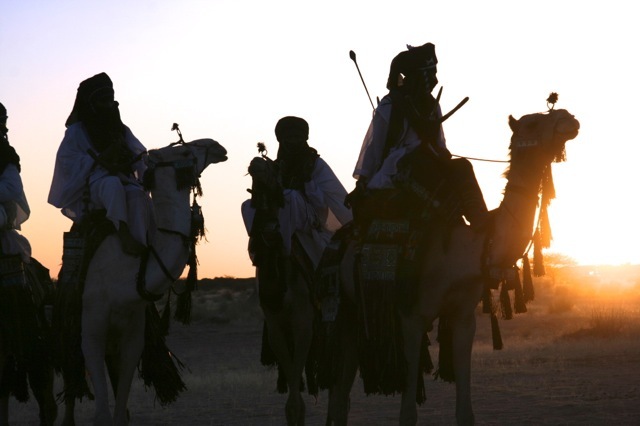 Tuareg cameleers circle Wodaabe dancers in a traditional nomadic festival. One of the students at the Tamesna school–8 year old Mahmoud–shows off on a camel. No lack of riding skills. 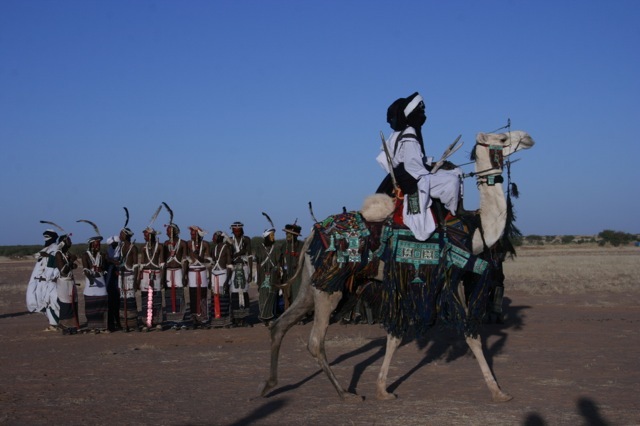 Proud Tuareg camel parades in front of the Wodaabe Yaake line. Benedicte filming the officials inspecting the new school. 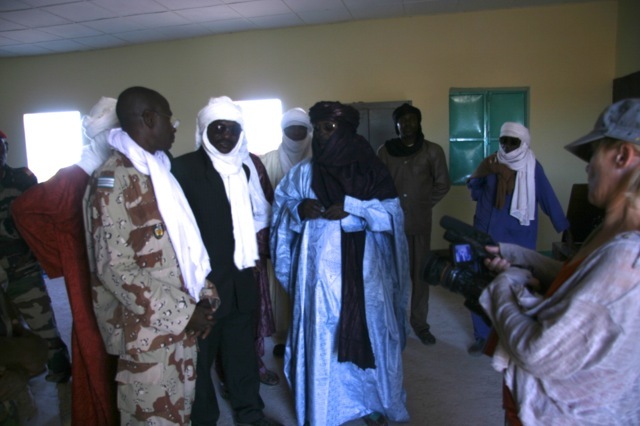 Niger national television interviewing Sidi. The piece aired before we got back to watch it, but many people told us about it. The film crew said in all the travels they do in the north to document humanitarian projects, they had never seen one more impressive: a health clinic, boarding school, adult education center electrified by students of the solar program, latrines, vaccination corrals, two wells, one solar powered and a 25,000 liter water tower, and fenced garden–all in the middle of nowhere! Something to be proud of. 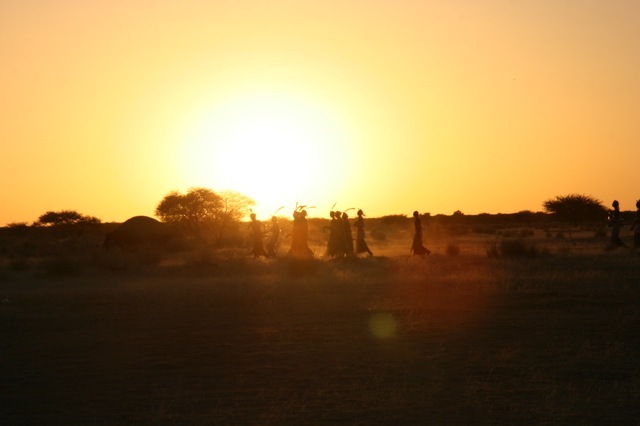 The Wodaabe leave as the sun sets. And the camels leave to rest and prepare for the camel race in the morning! Everyone went home for dinner, but the festivities were not over. A full concert with amplifiers and floodlights was planned for the night. When we arrived the crowd began to gather and eventually reached over 500. Hasso, who is a major rock star in Niger had brought his group who were warming up. The surprise for the locals was that Ned was called up to do a couple of his original songs–he decided on Loma Paloma, because it is a cowboy song which describes a beautiful remote pasture in the hills above Ojai, beloved by our family. 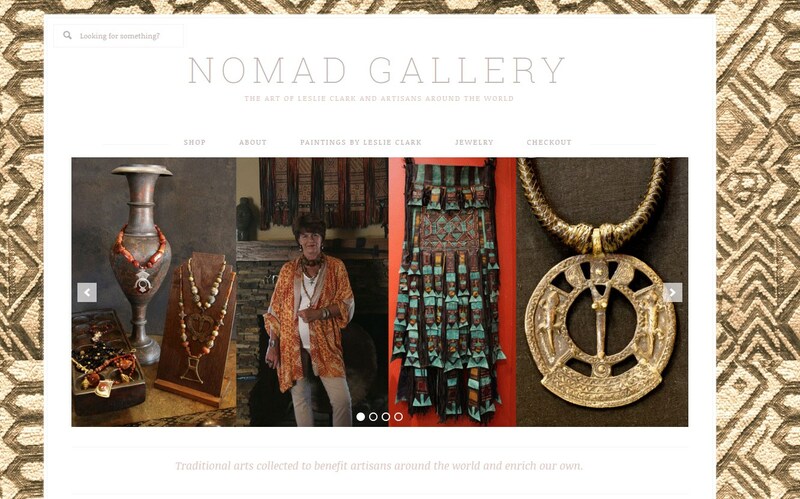 He knew they would relate to the appreciation of their animals and pastureland that herders around the world share. 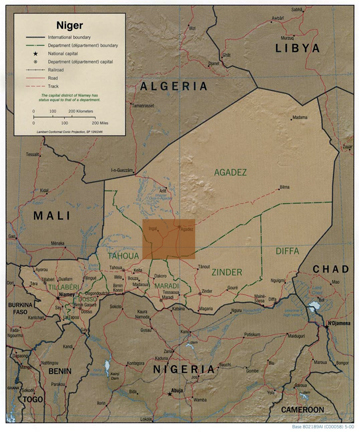 What he did not expect was that the back up band–Hasso’s group– would enthusiastically accompany him and totally change the rhythm from cowboy waltz to Tuareg camel desert rock. He forged on and the crowd loved it! They even asked me how to dance to it — to which I responded by showing a kind of swing–made them dizzy. 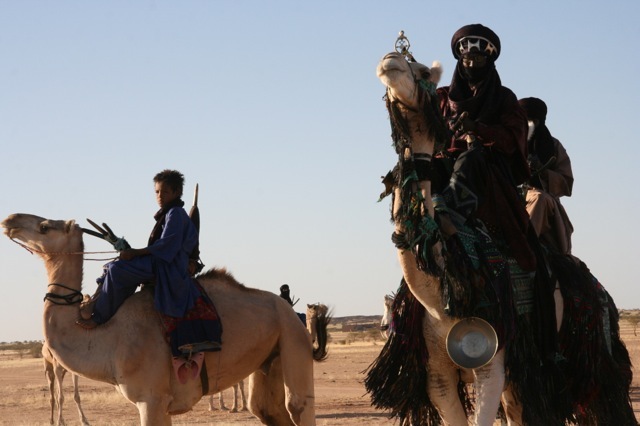 Ned was a huge hit–but his cowboy songs and rock dance beat has, I think, never been accompanied by the ululating that the tuareg always to do show their appreciation and encouragement during a song. I have no pictures, but it was filmed by the crew and the music taped on the trip will be the soundtrack for our film to debut at the Ojai Film Festival in November of 2015.